PE0197. LILY ELSIE, w.Arthur Margotson, Cicely Debenham & Bobby Howes: THE BLUE TRAIN – Excerpts (Stolz), from Original 1927 Cast recording; LILY ELSIE, w.Owen Nares & G. P. Huntley: PAMELA - Excerpts (Wimperis & Norton, from Original 1918 Cast recording. (England) Palaeophonics 101. Excellent transfers from these 1927/’18 recordings, w.Elaborate ‘The Play’ 20pp. Brochure replete w.photos from the London productions. “Elsie's biggest success came in creating the title rôle in the English-language version of THE MERRY WIDOW in the London production. Edwardes took Elsie to see the original German version (DIE LUSTIGE WITWE) in Berlin. Elsie was at first reluctant to take on the demanding part, thinking her voice too light for the rôle, but Edwardes persuaded her to accept. Edwardes brought her to see the famous designer, Lucile, for a style coaching. The production, with English lyrics by Adrian Ross, opened in June 1907 and ran for 778 performances at Daly's Theatre. Elsie created the rôle at Daly's and toured with it beginning in August 1908. The show was an enormous success for its creators and made Elsie a major star. One critic at the opening night praised ‘the youthfulness, the dainty charm and grace, the prettiness and the exquisite dancing with which Miss Elsie invests the part.’ I share the opinion of most of the first-nighters, who considered it could not have been in better hands, and could not have been better handled.... The night was a genuine triumph for Miss Elsie, and she well deserved all the calls she received’. 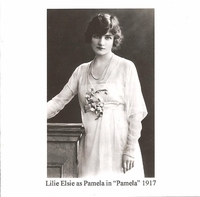 Lucile designed the costumes for Elsie in THE MERRY WIDOW (including the plumed hats that became an extraordinary fad) and thereafter used Elsie to promote her fashions, designing her personal clothes and costumes for several of her other shows. Lucile wrote: ‘That season was a very brilliant one, perhaps the most brilliant of the series which brought the social life of pre-war London to its peak. And just when it was at its zenith a new play was launched with a new actress, who set the whole Town raving over her beauty....’ Elsie's image was in great demand by advertisers and on postcards, and she received unsolicited gifts of great value from many male admirers (and even bequests). Elsie became one of the most frequently photographed beauties of the Edwardian era. According to the Atlanta Constitution newspaper in America, writing in 1915: ‘Perhaps her face is nearer to that of the Venus de Milo in profile than to any other famed beauty. There are no angles to be found about her any place.... If she came to America, she would undoubtedly be called the most beautiful woman In America. Nature never made a more brilliant success in the beauty business than she did with Lily Elsie. It was mostly from the nobility that her suitors came. Everyone agrees that Lily Elsie has the most kissable mouth in all England... she possesses the Cupid's bow outline with the ends curving upward delicately, all ready for smiles.... Strangely enough, the women of the land were among her most devoted admirers’. After THE MERRY WIDOW, Elsie appeared in another 16 shows, including in the very successful English language versions of The DOLLAR PRINCESS in 1909; as Franzi in A WALTZ DREAM, and as Angèle in THE COUNT OF LUXEMBOURG, both in 1911, garnering continuous praise. One critic wrote: ’…it gave great pleasure merely to see her walk across the stage’.